Safety is one of the most important factors of fishing on open waters. When you jump into a boat or kayak, you must feel secure! Imagine if you capsize and don’t have a life vest to help keep you afloat? Even if you are a strong swimmer, you may struggle. Fishing on a lake or a river can be dangerous enough and fishing in the sea or waters with strong currents can be even more so. This is why it is important you purchase an inflatable life vest for fishing. We know when making a decision, you are confronted with a myriad of options. 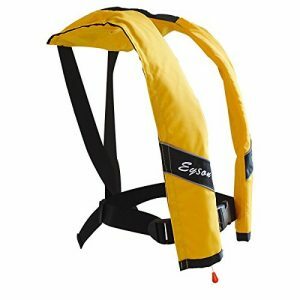 Different manufacturers make various life jackets and models. Moreover, there are many styles – from simple floatation devices, through fully inflatable jackets. Sometimes it can be overwhelming! We understand this and are here to help! 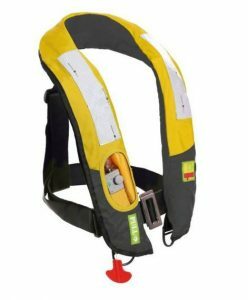 We have fantastic knowledge of angling safety devices such as inflatable vests. We will share this knowledge in the paragraphs below. As you read on, you will learn about what makes the best inflatable PFD for fishing and the different features these safety devices have. So what considerations should you look at when choosing the best inflatable PFD for fishing? Consider where you will be angling, what category of vessel you will sail in, and what you are comfortable wearing. Furthermore, consider your own swimming capabilities and strength. Where you fish, has a large impact on the category of inflatable safety vest for angling you buy. For example, if you simply fish at the side of a pond or lake, you will not need a high quality safety vest. Alternatively, if you are open water fishing, your safety device must be high quality – if you fell overboard, you would need a sturdy life jacket to battle against the sea. Fishing PFDs and life jackets, are split into several categories. 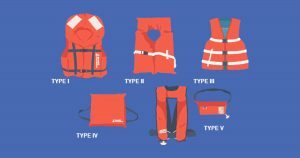 The US Coast Guard defines these categories from Type I through to Type V. Understanding the type is required for choosing a PFD. Type I – You should not need to use a Type I life jacket when fishing. This category of the jacket is usually intended for commercial vessels – it is rarely used for recreational purposes. A Type I jacket has a buoyancy of 22lbs. A Type I is best suited for remote locations and rough waters – this jacket also provides the greatest heat retention for your body. 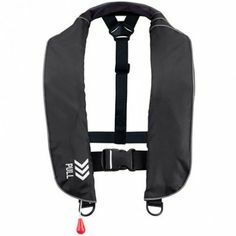 Type II – This category of life jacket is another you should not need to consider. It has an archaic design – orange padding with a single security strap. These security devices are generally uncomfortable. 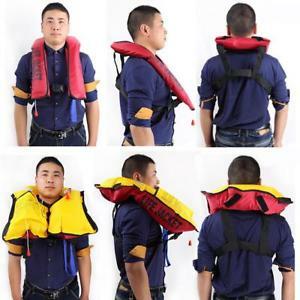 This is the category of life jacket you will typically see on small cruise liners or other light craft. A Type II can be inherently buoyant (i.e. already inflated), or it can be inflatable. Type III – A Type III jacket is the most common for kayakers and sailors. This category of jacket has the greatest array of designs and styles. A Category III provides buoyancy of 15.5lbs. A Class III jacket offers more comfort than both Class I and Class II. 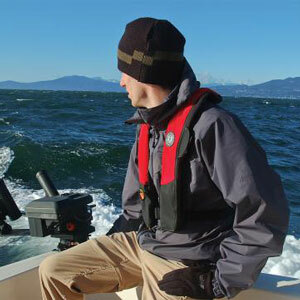 Common uses of this PFD inflatable jacket is for water skiing, canoeing, angling and kayaking. 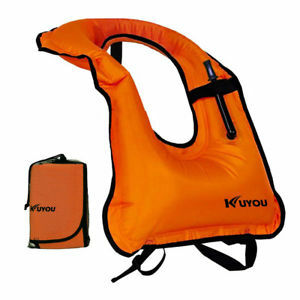 Type IV – If you are travelling in a boat longer than 16’,you must have a Type IV life jacket. Moreover, you must also have a PFD that can be thrown. 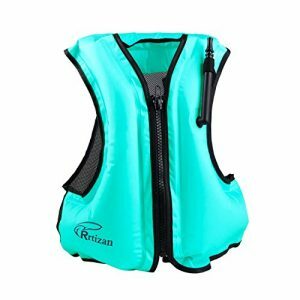 This class of life jacket is not meant to be continually worn – it is merely a rescue device that you throw into the water if someone has gone overboard. If you cannot swim, then a Type IV will offer little security; moreover it should not be used for children. 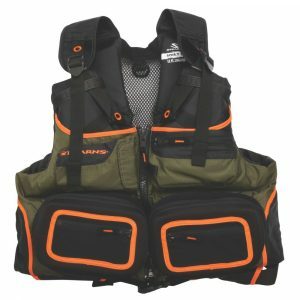 Type V – Anything that does not fall into the above categories is generally classed as type V. Different categories of PFD type 5 jackets include automatic inflation models, hybrid inflation models, and special use life jackets. As you can see there is a lot to take in! Don’t feel overwhelmed – once you understand the different categories of PFD inflatable devices you can easily make a choice. You just have to consider which vest category is most suitable for your angling venture. Generally speaking, Type III jackets are the most common for angling. As you will see below, fishers usually favor a Type II vest with plenty of pockets for their equipment. The material a jacket is made is critical. The single most important material consideration is how waterproof it is. 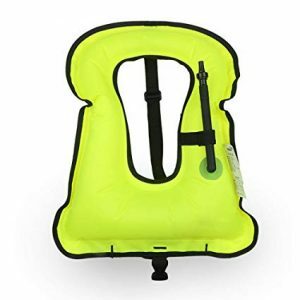 Why would you consider buying an emergency inflatable life vest that isn’t waterproof? This goes against the concept and point of this device. Waterproof inflatable angling jackets are typically made from Neoprene, nylon, and foam. The outer material is usually a webbing or mesh made of neoprene and nylon. This provides excellent protection from the elements and most importantly, water. The interior and padding is usually made from foam. This foam may be made from polyethylene or PVC. The foam is meant to keep water out, and also to help with buoyancy. 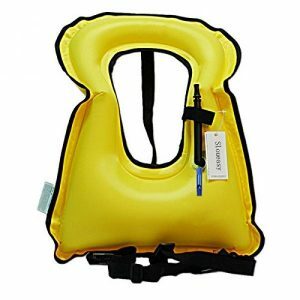 Aside from the main fabric and foam, a life vest usually has either plastic or metal straps too. When choosing a PFD, ensure it is made from buoyant and waterproof material for your own safety! When choosing a vest for fishing, it must be adjustable. By adjustable, we mean it should have straps that you can alter in length and tightness. Moreover, we mean whether the vest is inflatable or not. 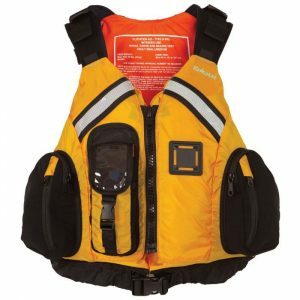 Generally, fishers avoid an inflatable life vest – these vests can restrict movement. Furthermore, it can also prove too bulky when inflated. This is why a non-inflatable vest is preferred. These vests have padding and fit better – it will still provide buoyancy too. In terms of adjustable straps, you need flexibility. Your vest should have straps that can accommodate your body. Moreover, the straps should be much longer so you can adjust them if necessary. 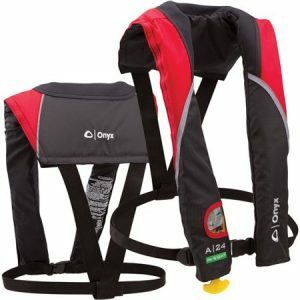 As a rule of thumb, the more straps a life vest has, the more suitable it will be. More straps means more security. When angling, you must have a vest with pockets! Why? Well how else can you carry your angling tackle and accessories? The best fishing life jackets have ample pocket space. Moreover, the pockets should be high quality, well-placed, spacious, and have quality fasteners. These are all things to consider when analyzing pockets. How many pockets does the life vest have? Where are these pockets placed? How much room do the pockets have? Are the pockets fastened by zippers, buttons, or Velcro? 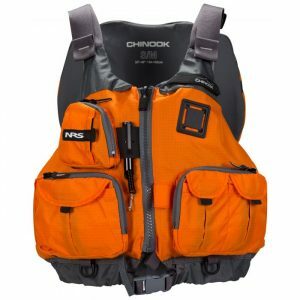 Take a good look at the pockets your chosen best fishing PFD vest has. Also, consider what angling tackle you usually take with you – bait, hooks, spare line, etc. How much pocket space do you actually need? Pocket space should never come at the expense of security or functionality – it is still important, however. If you are angling in cold waters, give heed to hypothermia protection. Hypothermia is one of the biggest killers of people who are submerged in cold water. Our body can rapidly lose heat and our core body temperature can drop quickly which can cause it to shut down, and hypothermia to set in. Hypothermia doesn’t take long to set in – you could be in cold water for 5 minutes and lose much of your strength. Type III inflatable life jackets for angling generally have hypothermia protection. Moreover, they allow sufficient movement so you can get into the HELP position (Heat Escape Learning Posture). Ensure if you are angling in cold waters, that your life vest for angling has appropriate protection and will minimize the risk of hypothermia. Sloueasy produces and sells a whole range of products including a brilliant range of safety devices. Their Sloueasy inflatable product is both fun and safe. Inflation can be completed within 10 seconds, and it can withstand pressure of 210 lbs for 12 hours. This is a simple design, but it is effective and causes minimal discomfort. You can easily wear the device and secure it in a matter of seconds. 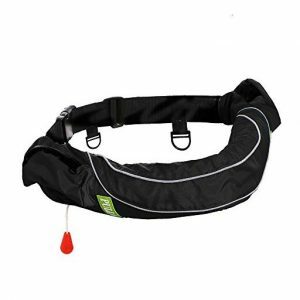 Furthermore, it offers excellent buoyancy and comes standard with a carry bag. Overall, this product provides a quick and easy to use solution. Furthermore, the design is robust and has some nifty features such as a care label and whistle. This design is similar to the Sloueasy model and offers similar features. We like the bright, vibrant color and the adjustable crotch strap. For your money, this really is an effective device that has a no-nonsense approach to security. 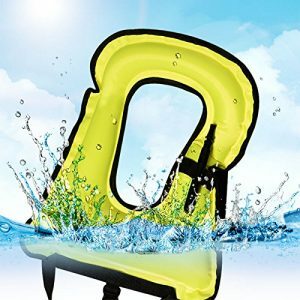 The ONYX A-24 is simple and easy to use – you can rest assured the automatic expansion feature will keep you float and secure in an emergency. We like the jerk handle which makes expansion a doddle. We just felt that the rearming kit should be included as standard. The standard package comes with a whistle, reflection bands, cylinder, blow tube, and the device itself. We like the comfort this product provides and the extra features it offers too. The durable material makes this item a superb purchase. It will last for years providing you take care of it. We also like the bright orange or green colors – you can easily be spotted in the water in an emergency. The standard package is well equipped although it doesn’t come with a spare cylinder. You get a whistle, reflection bands, blow tube, and 1x gas cylinder. The design is simple, the inflation is effective, and being CE certified is a big plus. This is one of the most simple designs on our list, but it certainly does the job. 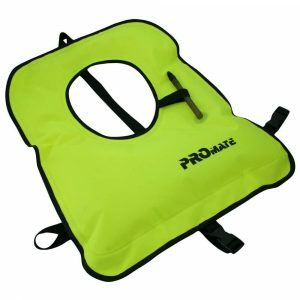 If you just want a cheap but effective model then the Promate Snorkel vest is a great choice – it is one of the best value for money pfds on our list. We like the Eyson ring and its unique design – it offers excellent safety features and is CE certified. You are guaranteed quality with this ring. This is a fantastic model for kids and adults. It is easy to use and simple to expand. The only thing we felt was missing was a crotch strap to prevent the model from riding up. What are life jackets made of? To ensure item is durable and will hold up in water, the materials used are very specific. The two main materials used in the creation of this garment are nylon and foam. Foam is used to pack the interior of the device and to improve buoyancy. Plastic foam is commonly used as it’s cheap to manufacture and still provide excellent quality – usual types include PVC and polyethylene. Nylon is used for the exterior as it is weather resistant and has a resistance to UV damage too. 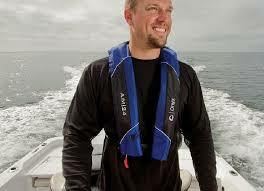 How do self-inflating life jackets work? There are two types of self-inflating jackets. The first is one you manually inflate using a pull chord. The jacket will have carbon dioxide gas chambers sewn inside the foam lining. When the cord is pulled, the gas is released – this inflates the chambers and the vest to provide flotation and buoyancy. The other type is a self-inflating jacket that inflates when it comes into contact with water. The gas releases when a dissolvable stopper dissolves upon touching water. Some garments are hybrid devices which combine both self-inflating features and natural buoyancy. How long do life jackets last? There is actually no set time period for how long a product such as this will last. A pfd could last as long as 10 years – it all depends on the quality of the material, and how you maintain your device. If you take little care and simply throw your product on the floor in your garage after usage, it will degrade quicker. Alternatively, if you care for it, regularly clean it, and store it properly, there is no reason why it could not last for years. 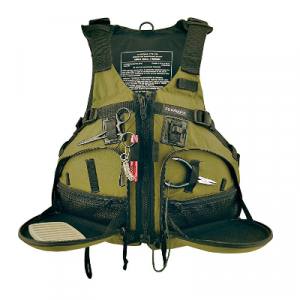 Always wash your PFD, and never leave it in direct sunlight – this can greatly improve the shelf-life of your unit. 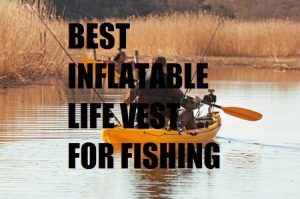 While every item in our top 10 list has its merits, we believe the Sloueasy model is the best inflatable life vest for fishing. The design of this product is ergonomic and well thought out. It has a myriad of useful features that make it comfortable and secure to wear. The extendable crotch strap, for example, provides extra security. Moreover, the nylon exterior is resistant to damage and is also lightweight and comfortable. Finally, the inflating mechanism has CE certification ensuring quality and reliability. We feel that the above item is the best, but as we’ve said, the other 9 items are fantastic in their own right. Eyson, for example, have the Slim Inflatable PFD, the adult PFD, and the belt pack which are three superb products. 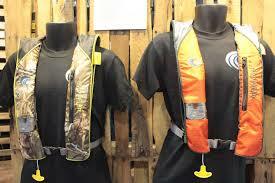 The KUYOU snorkel vest and the Kingswell portable vest which are also high quality and comfortable. We can’t forget the ONYX A-24 and the SALVS automatic jackets which have great inflatable features and ergonomic designs. If you pick any of these 10 units, you can enjoy a safe and secure fishing trip!